To say Vasyl Lomachenko wiped the floor with Anthony Crolla's mug on Friday night would be an understatement. The boxer known by his comprehensible movement in the ring ("The Matrix") went into last night's bout with Anthony Crolla a heavy, heavy betting odds favorite. Crolla was hand picked by the WBA as Loma's mandatory challenger. Had it not been for Vasyl's goal of unifying the lightweight belts, this fight would have likely never taken place. Vasyl layed the pressure on his opponent 3 and a half rounds before finding his window of opportunity. This is when he landed a crucial 4-piece combination on Anthony Crolla's frosty mug. The final result, an emphatic 4th round KO, was never really in question. But as I alluded to earlier, the mandatory challenge was essentially the last of Vasyl's sanctioned requirements before he unifies the lightweight crown in a winner-takes-all contest with Mikey Garcia. As you might recall, Mikey Garcia recently jumped to welterweight to take on perennial world champ Errol Spence in a losing effort, but that's hardly a blemish on his record, given the fact his power and mechanics translate better at his natural weight. Crolla for his part, could wind up a return champion if he sticks around long enough to watch the lightweight division thin out - but not until Vasyl, Gervonta Davis, and Mikey flee the scene after running out of "big money" propositions. For the record, Vasyl did call out Garcia in the post-fight interview. "I want Mikey Garcia. I want to unify titles. That's my goal. I want historic fights," he said. 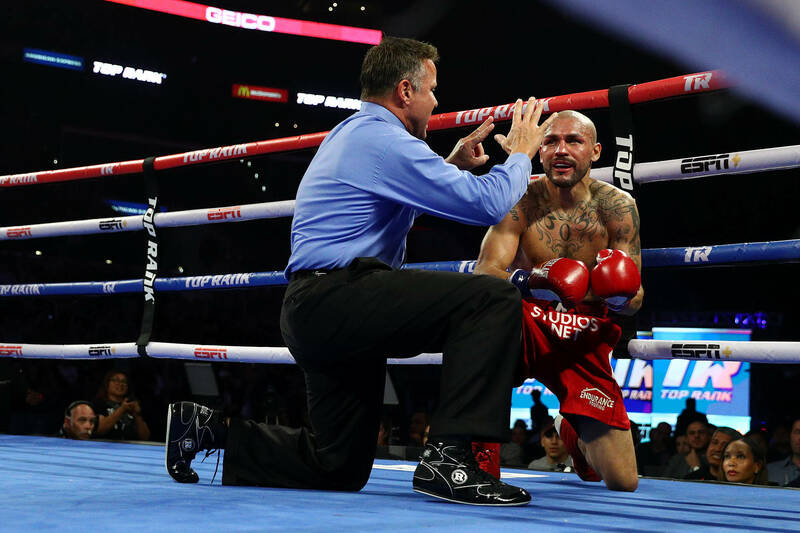 The Mexican-American fighter has said in the past that he's felt slighted by Lomachenko's unwillingness to fight without the "proper conditions" in place. We'll have to see if Loma stays true to his word. It's worth mentioning that Vasyl's Staples Center fight card served as the official launch for an ESPN+ boxing program curated by Top Rank promotions, whose chairman Bob Arum was eager to sing the Ukrainian's praises after the bout. "He's fantastic, unbelievable. I've never seen a fighter of that size be at that level, and I've been doing this for over 50 years," said Arum, who represents Lomachenko. "It's almost breathtaking."